"The history of Christianity is one of debate. As the Gospels reveal, Jesus was challenged right from the start. Rival schools like the Pharisees and Sadducees posed pointed questions to him, trying to trap him in his words and even to get him in trouble with the authorities. Our world is very different from the one in which Jesus lived. But the more things change, the more they stay the same. If people posed challenges to Jesus, they will do so to us as well." "Why shouldn't I believe in scientific materialism-the view that only physical matter and energy exist and that science is the key to all knowledge?" Because morality points us beyond the purely material and beyond what science is capable of establishing. Moral values are real. Some things are objectively right and some are objectively wrong. Showing compassion for the poor and the weak is good; torturing babies for fun is evil. Belief in moral values is a human universal that exists in all cultures. It is built into human nature, and it cannot be suppressed. Even those who profess philosophies denying moral realism cannot maintain the pretense. They invariably slip back into realist thinking and language, expressing either appreciation for acts they sense are good or outrage at acts they sense are evil. But science is not capable of establishing moral values (one of several limitations it has; see Day 333). It may be capable of studying what people consider morally good and bad, but it is not capable of establishing what is morally good and bad. This is known in philosophy as the "is-ought problem." Certain statements are descriptive, describing the way the world is. Others are prescriptive, describing the way the world ought to be. Science is capable of investigating the former, but it does not have the ability to investigate the latter. As philosophers have often put it, you cannot derive an ought-statement from an is-statement. The reason is that science involves an empirical methodology-one based on things that can be detected and measured by the physical senses or by physical extensions of them (e.g., telescopes, microscopes, radio wave detectors). But moral good and evil cannot be detected and measured in this way. They are non-empirical qualities. You cannot detect moral goodness with a technical instrument or torture someone in a lab and use an evil-ometer to determine how bad the act is. We thus have good reason, based on the universal human belief in moral realism, to hold that moral values are objectively real, but they transcend the empirical. This shows that there is a transcendental realm that goes beyond the purely material and the abilities of science. To help skeptics see the point, you may wish to propose examples of concrete things they will regard as morally evil." Now to be honest there were a number of readings that I went back and reread a few times. This book is not simple fluff - raw raw I am a Christian - stuff. It is the real meat and potatoes of the faith. I would be surprised if you could read this book and not be challenged on some point of theology. Unless you have had incredible formation in your spiritual life, this book will not only give you tools to defend the faith, it will also help you have a more solid spiritual footing in your own life. This book could be read by anyone in high school through to well past retirement age, and they would benefit from its instruction. After You read this book some of the topics tackled might not be immediately applicable, but I am sure there are a few you will think 'I wish I could have used this when …' and that is what the book will do. 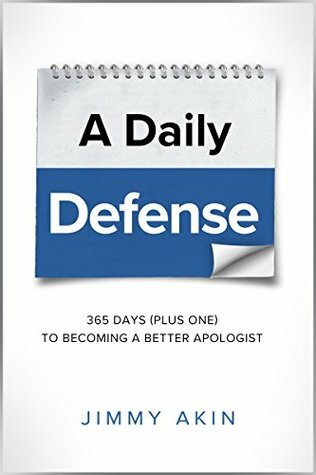 In easily digestible pieces it gives you a lot of tools in your apologetics tool belt. Even for the more difficult topics Jimmy writes in a very engaging manner, and to be honest, many days you will finish the reading and want more. And Day 366 gives you a long list of books to use to go deeper. A wonderful book that I highly recommend.